When Lupine started we had two main strands of the business, Duke of Edinburgh's Award work and Vegan walking holidays. Our last organised walking holiday that people could book onto was in 2016 and we are not planning to run any more open to all walking holidays for the forseeable future. If you are part of an established group of friends or family and would like to hire us to arrange the itinary and cooking on a walking holiday then please do get in touch. Read the walking holiday testimonials of past guests. What was special about a Lupine Adventure Co-op week-long walking holiday? 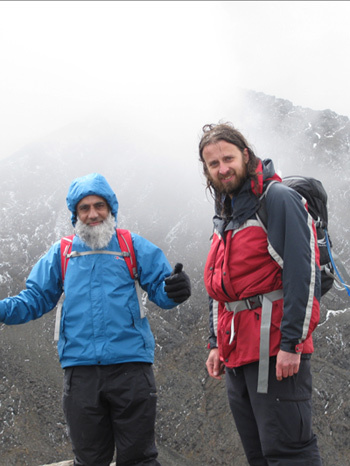 Your group will probably consist of 5-9 guests and at least two experienced Mountain Leaders. At the start of the holiday we will all go out walking together while we get to know each other and find out what everyone in the group wants to get out of the holiday. Each evening we will suggest various options for walks (and maybe other activities) for the next day or two and will plan what to do based on the responses we receive. Some days we will all walk together, some days we will run two separate walks and some days some people will walk while others take a boat trip or relax back at the cottage, it is entirely up to you. Because we staff these holidays with at least two qualified Mountain Leaders it gives us a flexibility that is almost unheard of on commercial walking holidays and should mean that everyone gets the maximum out of their holiday. Good food and nutrition is an integral part of Lupine Adventure walking holidays.When out walking your diet is very important. We will cook you great, tasty vegan food to give you the energy for all the walking you will be doing while you are with us. We try and balance the nutritional requirements of your body with the desire to eat really tasty ‘hey we’re on holiday’ food. All food that we prepare will be vegan. 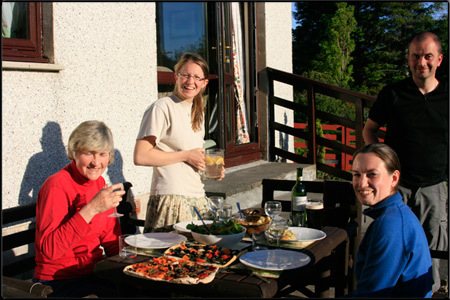 We decided to undertake the cooking for the holidays as, being vegetarian and vegan Mountain Leaders, working in the highlands for other holiday companies meant a diet of macaroni cheese, vegetable curry or cheese and tomato pizza for a week. As well as the evening meals we will regularly bake bread before breakfast, make flapjack to take out on the walks and bake vegan cakes to go with your post-walk cup of tea. Because our food is vegan it is suitable for Halal diets. However, some guests may drink wine on the holidays so the environment is not alcohol free (although the actual food is). If you wish to create your own custom trip then please get in touch. We can arrange everything including transport, accommodation, food, itinerary and qualified Mountain Leaders, or we can simply supervise the walking. Basically, we can do as much or as little as you want. We operate throughout Scotland, the Lake District, North Wales and Yorkshire. Contact us for a quote. We think that you will be pleasantly surprised at the value we offer.